Leading Supplier and Manufacturer from Mumbai, our product range includes Plastic Ball Pens such as Stick Polo Ball Pen and Plastic Ball Point Pens, Use and throw ball pens. Highly appreciated by the clients for their high tolerance, dimensional accuracy, light weight. > Minimum Order Quantity should be 64, 000 Pcs for Indian Enqueries. > Minimum Order Quantity should be one container for Export Enqueries. 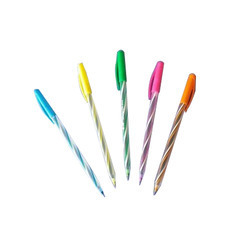 Owing to the rich industrial experience and expertise in this business, we are involved in providing Disposable Ball Pen. Relying on our expertise in this domain, we are into offering Ball Pen.